In the year 2099, the Marvel Universe proves that there will always be a need for heroes. In this dystopian future, society is ruled by corporate entities and it is harder than ever to rise above the status quo. But there is hope in a new age of Marvels. Jump through time to discover Marvel 2099, and see what lies on the horizon for your favorite heroes. Introducing Miguel O' Hara, Spider-Man of the year 2099! How did this former Alchemax engineer become the hero of Nueva York? Discover the origin of Spider-Man 2099 as he struggles against a future filled with violence and corporate corruption. Miguel O' Hara recounts the final chapter of his Spider-Man origin to his A.I. assistant, Lyla. Hot on the trail after his Spider-Man transformation, Alchemax deploys a cyborg bounty hunter to eliminate future Spidey. Enter Venture, the most dangerous villain of 2099! Glimpse into the future of Marvel's mutants in this time-bending one shot. What will the X-Men of the future look like? And with their planet in ruins from gamma-irradiated Hulks, will the world's remaining mutants band together for good? Peter Parker launched into 2099! After a dimensional rift sends Spidey reeling into the future, Marvel's present-day heroes collide with their 2099 counterparts. In the first chapter, Peter Parker witnesses the villainy of Alchemax, while Wolverine encounters Hulk 2099! Present-day Spider-Man is being held captive in the future. Plus, the dimensional rift he opened has left Manhattan vulnerable to the evils of Alchemax! Guest-starring 2099's Punisher and Human Torch! The temporal time-play continues as Washington D.C. is overrun with Hulks of 2099. Will Wolverine and Peter Parker be able to save their present...with help from the future? The penultimate issue to the Timestorm event! Guest-starring Doctor Doom 2099. Spider-Man 2099 splashes back onto the panels with this triumphant return. After taking down Public Eye Enforcers, Miguel O' Hara finds himself shunted through the time-space continuum. Is present-day NYC big enough for two Spider-Men? 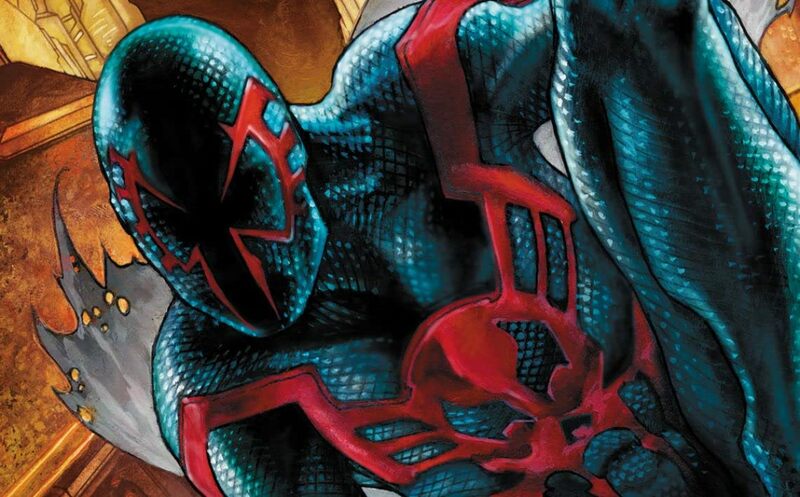 Spider-Man 2099 collides with Superior Spider-Man! Miguel O' Hara caught in the web of Green Goblin! After Alchemax unleashes lethal Spider Slayers in present-day Manhattan, Spider-Man 2099 confronts Superior Spider-Man. But these Spider-Men may need to set differences aside when Green Goblin reveals himself as the ultimate mastermind!